On a mild, calm and dry evening two teams gathered together to compete for the privilege of winning the inaugural Presidents Cup. The competition involved 11 players from each side, with the 'A' and 'B' teams captained by Frank Griffith and Richard Bayley respectively. After a close finish the 'A' team nudged ahead to gain victory by just 57 points. When you consider the 'A' team have recently been promoted to Division 2 and the 'B' team are in Division 5, it was a far slender win than many had thought. 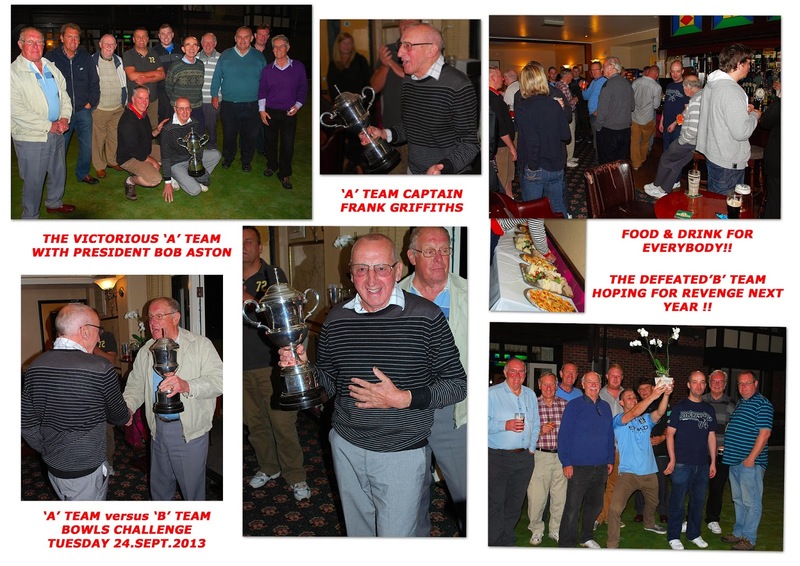 Club President Bob Aston not only provided and presented the trophy, but also a very pleasant post-competition buffet for all in the bar. The event was well attended and thoroughly enjoyed by players, supports and their guests. On another note this was the time Frank Griffths chose to officially announce his decision to step down as Captain of the 'A' team at the end of this season. Frank has been a highly regarded captain for many years and his fellow 'A' team members marked the announcement with the presentation of an engraved tankard.